One of the area's most colorful and legendary residents was Judge Roy Bean. Justice was swift and Judge Bean's word was the Law West of the Pecos. The first Justice of the Peace in Pecos County, the judge was a legend even in his own time. Preserved by the Texas Department of Transportation, the original Jersey Lilly saloon-courtroom, named after Bean's idol, Lillie Langtry, still stands in Langtry, providing travelers with a historic view into the past. Visitors can learn about some of the legendary escapades of Judge Bean, including his successful promotion of the Maher-Fitzsimmon prize fight in February 1896 in defiance of the United States and Mexican law. Besides the Jersey Lilly, visitors are treated to a beautiful cactus garden and interpretive trail as well as the Judge's "Opera House", once his home. Inside the Visitor Center, dioramas portray Judge Bean's illustrious career. The silver spike that connected the transcontinental tracks of the Southern Pacific's Sunset Route was driven a short distance away at Dead Man's Gulch in 1883. The tracks stretched from New Orleans to San Francisco, opening a southern route west. Open daily - 8:00 a.m. to 5:00 p.m.
Summer Hours (Memorial Day to Labor Day) - 8:00 a.m. to 6:00 p.m.
Closed Thanksgiving, Christmas Eve and Day, New Year's Day and Easter. 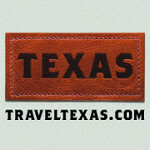 For more information, call 432-291-3340. 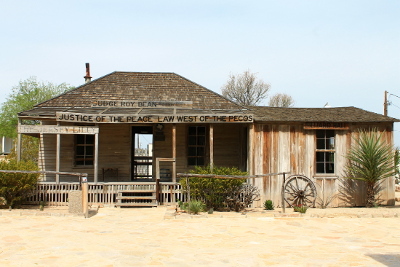 The Judge Roy Bean Visitor Center is on the Law West of the Pecos Loop Itinerary.